America's military is going high-tech, and these companies are leading the way. Invented in China in the 9th century, and used here in America since -- well, pretty much ever since we found the place -- gunpowder and the guns that use it form the mainstay of the American military. Whether it's a bullet fired from an M-16, a round from a Navy destroyer's cannon, or a 30 mm shell shot from an A-10 Warthog, chances are, if it comes out of the barrel of a gun, gun powder provided the impetus. Before explaining these three top picks, I think that a few words explaining why lasers are the future may be in order. Very briefly, they boil down to just three factors: speed, price, and space. Speed: Even the fastest gunpowder-propelled projectile moves at multiples of the speed of sound, measured in miles per hour. Lasers, in contrast, move at the speed of light -- tens of thousands of miles per second. 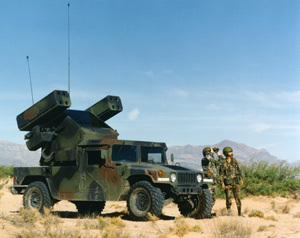 Lasers represent an orders-of-magnitude improvement over traditional projectile weapons in the range and time to target. Price: High-tech they may be, and probably expensive to develop -- although recent contracts have been relatively modest in size -- the economics of laser guns still look very compelling. Because the "ammunition" that goes into a laser is basically just the electricity needed to power it, Chief of Naval Research Rear Adm. Matthew Klunder says that the Navy's new Laser Weapon System (LaWS), for example, costs only "about one dollar to shoot." That's when compared to $70,000, for example, for Raytheon's latest high-tech rocket. Since taking the lead on the Pentagon's Airborne Laser project more than a decade ago, Boeing has remained a force to contend with in the race to convert the American military to laser guns. Last year, Boeing unveiled a new 10 kilowatt High Energy Laser Mobile Demonstrator, or HEL MD, small enough to be loaded onto an armored car, accurate enough to shoot down fast-moving incoming artillery targeting U.S. troops, and powerful enough to destroy hostile unmanned aerial vehicles, as well. Boeing's working fast to up the power of its HEL MD, as well, with the Pentagon targeting a power output of 50 or 60 kilowatts, or even more, to boost the weapon's range and lethality. The company also has other "laser gun" projects in the works, including the most recent announcement of a modular, four-part compact Laser Weapons System that can be carried by infantry on the ground -- no armored car required. Artist's illustration of a mobile laser weapon system that Raytheon is building for the U.S. Marine Corps. Source: Raytheon. Raytheon sees Boeing's 10 kilowatt HEL MD -- and raises it 15 kilowatts. The company's new Ground Based Air Defense Directed Energy On-the-Move Future Naval Capabilities laser, built for the U.S. Navy, is designed to shoot down both drones and low-flying piloted warplanes. Like Boeing, Raytheon says it's hard at work building new and improved lasers offering "increasingly higher power," and expects to have them ready "in the very near future." Growing at just 8% annually, Raytheon lags Boeing in one respect. On the plus side, its stock costs just 14.5 times earnings, and pays a 2.6% dividend -- equivalent to Boeing's dividend yield..
No longer in service, the early 2000s Airborne Laser Project was a team effort among Boeing, Northrop Grumman, and Lockheed Martin. Photo: Wikimedia Commons. Lockheed Martin's laser ambitions are arguably more ambitious than either Boeing's or Raytheon's. While its rivals are busy building lasers to shoot down airplanes, Lockheed Martin wants to build one that can shoot down from an airplane, and attack targets on the ground. Lockheed's shares are priced somewhere in between Boeing's and Raytheon's at 17.2 times earnings. It's projected to grow earnings at 8.9% annually during the next five years. Perhaps best of all, Lockheed pays a more generous dividend than either Boeing or Raytheon -- 3.2%. We don't have a photo of Lockheed Martin's latest laser gun to show you -- but this pic proves that Lockheed's laser exists -- and that it works. Photo: Lockheed Martin.